Arthur P. Mange taught in the Biology Department at University of Massachusetts Amherst for 31 years before retiring in 1995. A co-author of numerous works in human genetics, Mange served on the chair of the Conservation Committee in Amherst, and currently serves on the Burnett Gallery Committee. 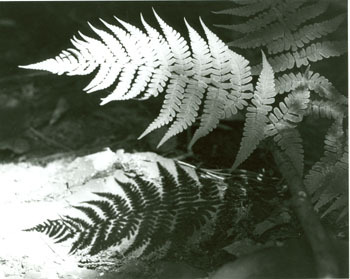 In 1983, his New England images were featured in Across the Valley (from Cummington to New Salem) held at the Burnett Gallery. This exhibition was followed at the Hitchcock Center in 1984 with Delight in Familiar Forms (celebrating some well-known plants and animals), with Ring Bell to Admit Bird at the Jones Library and Net Prophet at Cooley Dickinson Hospital. Architectural Sights — Big and Small, Mange’s most recent show (2002), appeared at the Burnett Gallery. In addition to exhibitions, Mange has also donated collections for fund-raising auctions at New York University, the Cooley Dickinson Hospital, the University of Massachusetts Fine Arts Center, the Amherst Historical Society, Jones Library, and the Amherst Community Arts Center. His photographic collection spans more than half a century of subjects reflecting his varied interests in animals, plants, our region, gravestones, what he calls “whimsical signs,” and attention-grabbing shadows. In 1957, a group of Quakers in Rindge, New Hampshire, established an independent worship group affiliated with the Connecticut Valley Quarter which became the Monadnock Quaker Meeting in the following year. From 1957 to 2011, members of the meeting supported the Meeting School in Rindge, a co-educational boarding school run on Quaker principles. The records of Monadnock Quaker meeting offer a perspective on the growth of the Society of Friends in southern New Hampshire over more than half a century. As kept by the meeting clerks, the records for the early 1980s include a jumble of newsletters, notes, drafts, and minutes of meetings which appear to be nearly complete. Founded in 1975 in Lebanon, NH, by Beth Dingman, Claudia McKay (Lamperti), Katie Cahill, Nina Swaim, and Shelby Grantham, New Victoria Printers became one of two all-female print shops in New England at the time. Believing strongly that “the power of the press belongs to those who own it,” they began to solicit work from non-profit and politically-oriented groups. Like its namesake Victoria Press, an 1860s women run print shop in London owned by Emily Faithful, an early advocate of women’s rights, New Victoria was also committed to feminist principles. The shop offered work and training in printing, machine work, and other traditionally male dominated fields; initially focused on printing materials from the women’s movement; and was organized as a collectively owned and democratically run organization. Additionally, the shop functioned as a de facto women’s center and lesbian hub for Lebanon and the surrounding area, often overlapping with the lesbian social club Amelia Earhart’s Underground Flying Society, (a.k.a. the Amelia’s). The print shop was a place of education, community, creativity, and activism, and soon publishing opportunities, as the group founded New Victoria Publishers in 1976 to publish works from their community. The print shop closed in 1985, with Dingman and McKay taking over the running of the non-profit publishing company out of their home in Norwich, VT, with an emphasis on lesbian fiction in addition to other women-focused works. An early bestseller, Stoner McTavish by Sarah Dreher, put them on the map, with the company publishing over a hundred books by and about lesbians, winning three Lambda Literary Awards and several other honors. The New Victoria Publishers Records consist of photographs, newsletters, and cards put out by the collective, materials printed by the press, marketing and promotional materials, author correspondence, graphics and cover art, book reviews, financial and legal records, histories of the organization, news clippings, and an almost full run of the books published by the company. The collection is particularly rich in documenting the work and production of a women owned business within the feminist press movement as well as the lesbian publishing industry. A resident of New Ipswich, N.H., Clark Obear was an ardent supporter of the temperance and antislavery movements, and was deeply involved in the affairs of his church and community. A teacher in Hillsborough County schools, Obear also worked as a farmer and insurance agent, and served in public office as a deputy sheriff, a Lieutenant Colonel in the militia, a fence viewer and pound keeper, and for several years he was superintendent of schools. Obear and his wife Lydia Ann (Swasey) had two children, Annabel and Francis. The four diaries in this collection contain brief, but regular entries documenting Clark Obear’s daily life in New Ipswich, N.H. during the middle years of the nineteenth century. Despite their brevity, the diaries form a continuous coverage of many years and offer details that provide a compelling sense of the rhythms of life in a small New Hampshire village. Of particular note, Obear carefully notes the various lectures he attends in town and the organizations of which he is part, including reform movements like temperance and antislavery. Carol A. Perkins was born April 25, 1926 in Rochester, N.Y., where she attended Madison High School. Her father, Vernon Perkins, was a World War I Army Air Service photographer in France, and she became interested in photography through his photograph albums. She graduated from a correspondence program at the New York Institute of Photography and graduated from the Rochester Institute of Technology School of Art in 1950. After matriculating from the Rochester General Hospital School of Medical Photography, she was employed at the Toledo Hospital Institute of Medical Research for twenty-two years, and then by the Medical College of Ohio for eleven years. While searching through New England graveyards for her Perkins ancestors, she became interested in gravestone studies and became a member of the Association for Gravestone Studies. 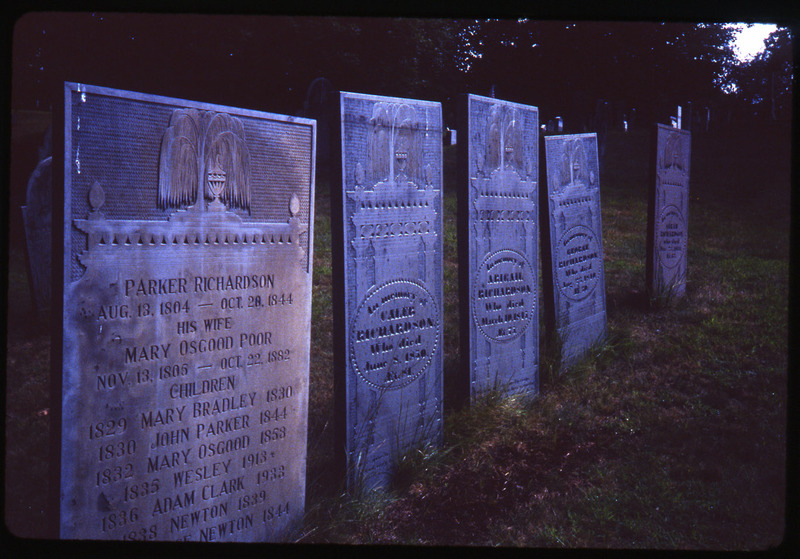 The Carol Perkins Collection consists of 1.5 linear feet of material, primarily color photographs of grave markers in Connecticut, Indiana, Massachusetts, Michigan, New Hampshire, New York, Ohio, Rhode Island, and Vermont. Box 1 has two indices: one alphabetical by deceased’s surnames, and the other alphabetical by state, then town, then cemetery. Box 2 photographs include transcriptions of the deceased’s names, dates of birth/death, and inscriptions, and are organized by state, then town. The collection includes one folder of genealogical material and 20 black & white photographs of markers in England. Photographs taken at AGS conferences include some AGS members and were taken in the following years: 1980, 1981, 1982, 1987, 1988, 1990, 1991, 1992, 1993, 1995, 1996, 1997, and 2003. A wealthy merchant from Portsmouth, New Hampshire. Includes details of his ventures in ship owning and his investments in manufacturing companies and real estate. Also contains total assets of his “property in possession” as of January 1845, and lists of debtors, including men, women, businesses, religious groups, and political groups. A farmer and laborer in Antrim, N.H., Thomas Dimon Twiss was born in Beverly, Mass., in 1801. At the age of 24, Twiss married a local Antrim woman, Betsey Brackett, with whom he raised a family of three children. This typical single-column account book of the mid-nineteenth century records Twiss’s diverse economic transactions, providing labor for the town in “braking rods” [breaking roads] and “digin graves”and to neighbors and for a wide variety of manual farm labor, including killing hogs, plowing, threshing, haying, and assorted carpentry work.